As in all fantasy stories, there are powerful artifacts that can be collected by your Heroes. The right Artifact could well be the key to vanquishing your foes. Some of the less powerful artifacts can be purchased in certain towns, but the most important artifacts are considered valuable treasures. Only Heroes who defeat the vile guards who protect them can claim such artifacts. 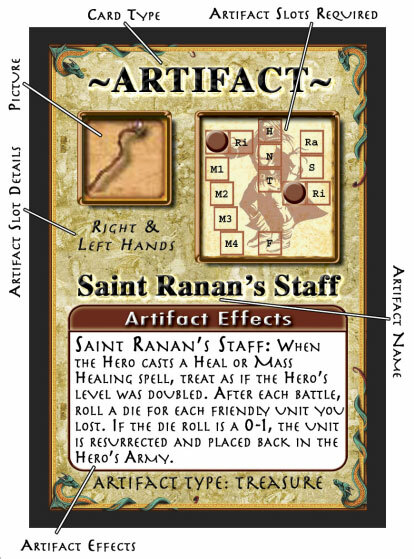 Below is a diagram you can refer to when the rules mention the entries on an Artifact Card.